This is the older of the three cemeteries I had a chance to visit over Easter weekend. They call the cemeteries w above-ground tombs Cities of the Dead. It is an apt name. Most cemeteries I have visited the dead buried in facing one direction. I haven’t ever been to a cemetery where the Romany (aka Gypsies, which some consider a pejorative term) are buried. They traditionally bury their dead standing. However, I just bet the graves face one direction. 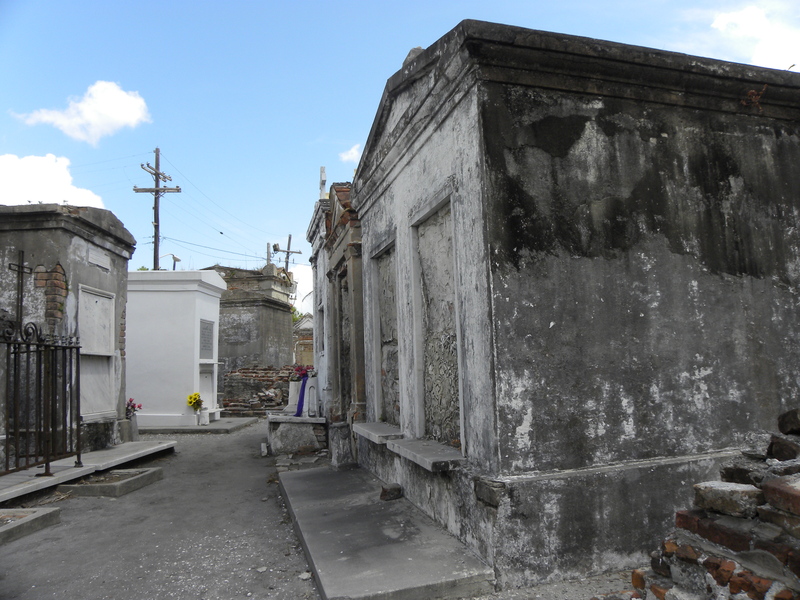 In the New Orleans cemeteries, the family tombs are organized along what can only be described as streets. And, there are distinct alleyways. There seems to be a main avenue and then side streets, too. In St. Louis No. 1, though, there are also segregated portions based on religion. AAH! Why do I sit here considering the type and danger level of zombies in graveyards? There aren’t any. I wander cemeteries on a regular basis. I have never seen a ghost, heard a strange noise, felt an odd breeze, or been attacked by zombies. In reality, what horrifies me the most are the graves of young mothers and their dead children. Particularly when the family plot contains so many children who lived for a just a few days…and sometimes just a day. Recently, pop star Libby Allen suffered her second still-birth. While the media called it a miscarriage, she actually lost a six month fetus. That is a still-birth, not a miscarriage. How awful for her. I wonder if many of those dead infants in cemeteries were still-born. I’m not even sure how a person would go about researching such a thing.